Nestled on a secluded, private road sits a luxurious custom-built French Normandy home befitting of French nobility. Eagle Watch Estate is a beautifully constructed property complimented by its immensely scenic 5 acres of land. The defining feature of this home is Pennypack Trust’s 800 preserved acres directly extending the backyard. This home becomes an oasis for all those who feel serenity surrounded by the soothing sound of nature, identifying new birds, and a clear view of the stars in the night sky. You will be hard pressed to find a home as grandiose and welcoming as this one. 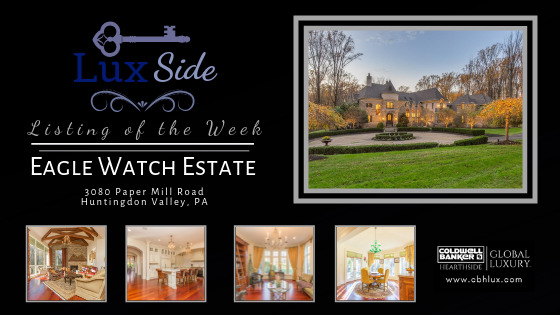 Eagle Watch Estate is located at 3080 Paper Mill Road with the historic city of Bryn Athyn nearby to explore. With 14,000 square feet and three levels of luxurious living space, you will have ample space to spread your wings. This beautiful home is custom-built to blend aesthetic, comfort, convenience and luxury perfectly. Visitors immediately take notice of the marvelous arched mahogany doors and high ceilings extending upwards of 22 feet. Sunlight floods the home with floor to ceiling windows, diverting your gaze to nature’s beauty outside. During the cold winter months, the estate transforms into a winter wonderland where you can effortlessly find warmth by any of the five fireplaces. Once inside you will find a formal dining room, den, robust kitchen, massage room, large home gym, entertainment room, three multi-leveled terraces, multi-leveled great room, hearth room, five bedrooms, and 3.5 baths. A welcome and prominent addition is the carriage house across the walkway that is perfect for au pairs, family or the ideal home away from home for your guests. Car aficionados will be delighted to learn about the estate’s generous garage space. The house features a four-car garage with additional parking for three below the carriage house. Elegance, intensity, and magic come together when Eagle Watch Estate transforms itself into a venue fit for a fairy tale. Every gathering will be an affair to remember as guests’ indulge in the wine-tasting area, challenge each other to pool in the entertainment room and enjoy a beverage on one of 3 patios overlooking the backyard. Drop your stress at the door; find tranquility in the massage room or with a fresh cup of coffee in the breakfast area. If you’ve been making excuses to avoid the gym, you may have to find new reasons as this home is fully equipped with a sizeable personal gym. With a house that looks fit for French nobility, you can expect to be treated like French nobility. The private terrace in the master suite is the perfect destination to gaze upon your majestic kingdom. The master bath is complete with double sinks, a large shower stall and soaking tub you can emerge from feeling revitalized and ready to seize the day. A name as strong as Eagle Watch Estate sets an expectation of a home that is as captivating as the name, in all regards Eagle Watch Estate soars beyond your wildest expectations. For more information check out the listing here.